Title : Living in Italy: the Real Deal - Hilarious Expat Adventures . I have often had fancy thoughts of buying a nice little B&B in Italy. I have travelled there before on a road trip and found it such a beautiful, stunning and friendly place. So when I saw the title of this book, it grabbed my attention straight away. It is a good read and one that I would recommend if you were thinking of taking up a project such as this one. I like the way that the author takes us through the stresses and frustrations of the bureaucratic red tape and the fun that he and his partner Nico experienced. We often hear or read about dodgy, lazy builders that like to slack off and never seem to get renovations finished either on time or within budget. This certainly proves those points. The builder, Torti and his workers are an absolute nightmare and how on earth the owners managed to put up with them till the end of the project is beyond me. You can see how Italian builders get such a bad reputation. The description of the Oltrepo region has been written with feeling. I almost felt as though I was driving through the Italian countryside. At first I was not sure about the way Stef (the author) included Italian words into the dialog, but after a while it began to make more sense and I could see what he was trying to achieve. By the end of the book I found my self thinking that these Italian words would be helpful to those readers that are thinking of going to Italy.This is an easy and relaxing read. It made me curious to see the final result, so I took a sneaky peak at the B&B website. Maybe I will take another Italian trip and book my stay with Stef and Nico. 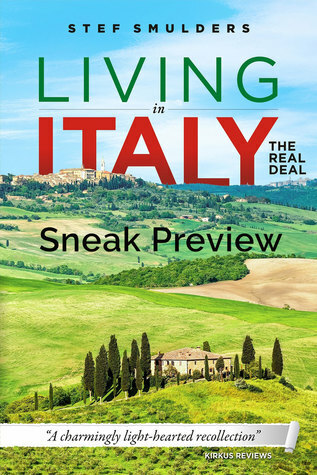 We are proud to announce that LIVING IN ITALY: The Real Deal- Hilarious Expat Adventures by Stef Smulders is a B.R.A.G.Medallion Honoree. This tells a reader that this book is well worth their time and money!